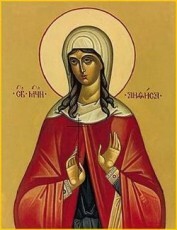 St. Anthusa was the daughter of the Iconoclast emperor Constantine Corpronymos. She and her brother, the future emperor Leo were born twins in 750. The Empress suffered very much with their birth so her father summoned Abbess Anthusa of Mantinea from Prison and asked for her prayers. The Abbess predicted the bith of the twins and their fate, and the daughter was named in her honor. When she grew up, the emperor began to urge her to marry. But from her youth St. anthusa yearned for monasticism and would not agree with his suggestions. She waited until after the death of her father, and used all of her personal property to help the poor and orphaned. He brother Emperor Leo’s wife, treated her with love and esteem and invited her to be co-regent. St. Ann did not accept as she did not want worldly honors. Being at court, she wore clothes beffiting her position as an Emperor’s daughter, but underneath her finery, she wore pagan clothing. St. Anthusa founded the Omonia Monastery in Constantinople, known specifically for its strict rule. St. Anthusa was herself and example of humility. She did hard work, she cleaned the Church and carried water. She never sat at the table during meals, but instead served her Sisters. She saw to it that no one left the monastery uncared for. She was a humble and gentle soul, who lived to the age of fifty-two, and died peacefully in 801. St. Anthusa was born into a noble, royal family. She had every birth right to keep her place in society as a noble woman. She however, did not desire the things of this world, but rather that of God. She waited for her father to pass, and founded a monastery, giving her riches to the poorest of the poor, and served those in her Convent. She shows us that if we stay in tune with God’s Will for us, we can find the peace and happiness we desire. In many cases, it is not in ways we think, but what God wills for us – that we find true happiness and peace in our lives. Through the intercession of St. Anthusa, we can find the Will of God in our lives, if only we call upon her assistance.